A big part of online advertising revolves around paid advertising and if it is implemented thoroughly the results can be highly favorable. Since banner ads form the face of paid advertising, one needs to get them right to make the most impact. These days, you can create banner ads with the help of numerous online resources that let you develop a web banner design in easy steps. However, if you want to create a professional and powerful web banner that will attract higher click through rate (CTR) then you have got to invest in a professional banner design company. If you want website banner design services in Mumbai, ColoredWeb is more than happy to help you out. We help you build outstanding banners of different styles that will easily get you the results that you have been eyeing. Whether you want static ad banner or flash banner or video banner or some other style, our team of designers will give you the accurate ad on your terms and conditions. Our attractive and effective banners are tailor made to catch the eyes and attention of the users. Everything like the color, font, visuals, call-to-action and other elements are designed to complement your product/service. What is more, we specialize in different niches such as e-commerce, travel, hospitality, entertainment, etc. Through the course of our operations, we have learnt the intricacies involved in the creation of specific banner ads. And we know which types of ad will serve best a particular niche. For ex, the e-commerce segment needs frequent ads to promote seasonal offers, discounts, new launches, etc. 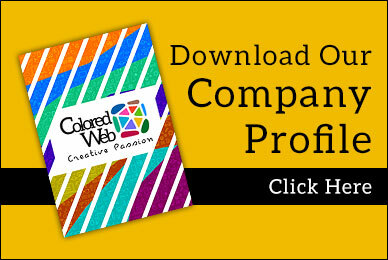 And hence, you can completely rely on ColoredWeb to cater to your particular demands and needs. We will put our best foot forward to build a brilliant banner ad design and if you want you can also ask for changes. We always welcome feedback from clients.